Graphene possesses a set of unique properties, making it a 'wonder' material. Researchers from several universities have teamed up to develop a radical kind of transistor. Instead of using silicon, the team used graphene to build a logic gate series that uses less power but could work 1,000 times faster than current ones. The discovery of graphene in 2004 began a flurry of studies to isolate other two-dimensional materials. Graphene was found to be a wonder material, possessing a set of unique and remarkable properties. One of these is its ability to conduct electricity ten times better than copper, the most commonly used conductor in electronics. At room temperature, graphene is also capable of conducting electricity 250 times better than silicon, a rate faster than any other known substance. These properties led a team of researchers from Northwestern University, The University of Texas at Dallas (UT Dallas), University of Illinois at Urbana-Champaign, and University of Central Florida (UCF) to consider developing a graphene-based transistor. In a study published in the journal Nature Communications, the team found that a graphene-based transistor could actually work better than silicon transistors used in today’s computers. A quick explanation first: Transistors are key in today’s computer circuits, as these act as on and off switches that allow electronic signals and electrical power through. When put together, transistors form logic gates — the core of microprocessors, serving as input and output and acting either as 0s or 1s (so-called binary bits). These are what allow microprocessors to solve logic and computing problems. Technology is changing the way we live, learn and work. How can leaders make sure we all prosper? Microprocessors built using silicon transistors have been stuck at processing speeds mostly in the 3 to 4 gigahertz range since 2005. There’s a limit to the rate of signals and power these transistors can handle, largely due to the material’s resistance. The team of researchers, however, found a way through this limitation by using graphene instead of silicon. The researchers first built a graphene ribbon by unzipping a carbon nanotube (a thin folded graphene sheet). They then applied a magnetic field to the graphene ribbon, which made them realize they could control the resistance of the flowing current through the ribbon. By using adjacent nanotubes to increase or decrease the current, the magnetic field could control the flow of current. The team’s graphene transistor-based logic circuits improved the clock speed of microprocessors by a thousand times, and would require a hundredth of the power required by silicon-based computers. Plus, these circuits were also smaller than logic circuits that use silicon transistors. This could allow for smaller electronic devices that squeeze in more functionality, Gelfand explained. A similar study also explored graphene as a potential capacitor for quantum computers. 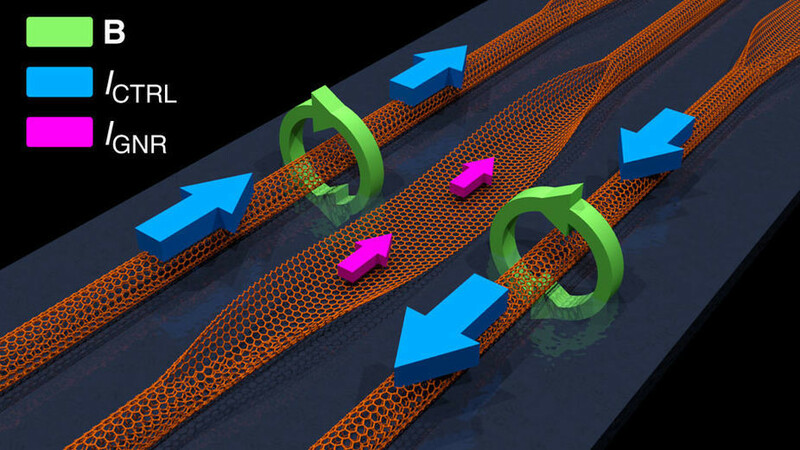 An all-carbon computing system still exists only on the drawing board, says co-author Joseph S. Friedman of UT Dallas, but Friedman and his collaborators in the NanoSpinCompute research laboratory are currently working on a prototype.